Yarrow is distributed throughout the United States except Arizona, New Mexico, and parts of southern Texas. 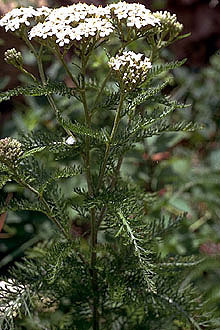 Yarrow is generally found at elevations of 1200-3350 m but can also be found as low as sea level. State route 520 at Montlake, 1 plant. Yarrow grows in meadows and pastures, along stream edges, in sand dunes, and along the edge of woodlots. It tends to grow on poor soils and is very drought tolerant. Flowering starts in April at lower elevations continuing through September at higher elevations. Fruiting occurs during August and September. Collect seed heads and allow them to air dry indoors for at least a week before cleaning. Crush the heads with a rolling pin to remove the nutlets, then sieve the nutlets and chaff to separate the seed. Cold store dry seeds in a sealed container. Seeds are nondormant and germinate over a variety of temperatures. Once dried, seeds can be stored for a medium amount of time. Cold store dry seeds in a sealed container. Propagation recommendations (plant seeds, vegetative parts, cuttings, etc.) Sow indoors in late winter and transfer to larger containers in six weeks, or sow outdoors in late April. May be grown in well-drained, moist soil but they establish best with the addition of fertilizer. They grow best in full sun, but will tolerate some shade. Seed, seedlings are the best form for installation. Moderate lifespan, up to 3 feet tall.